Learn to set up your server and website yourself and make it lightning fast! This step-by-step guide will show you how to set up your server using Linux, Nginx, MariaDB, PHP-FPM, Java, IPv6, HTTPS, HTTP/2, WordPress and much more! Are you currently having hosting problems? Do you feel that your site slowlyness is killing sales or traffic? Would you like to fix the shaky fundaments of your website? What if there was a single, high quality resource of information on creating a solid foundation for your website, using the best open source software available? Look no futher! 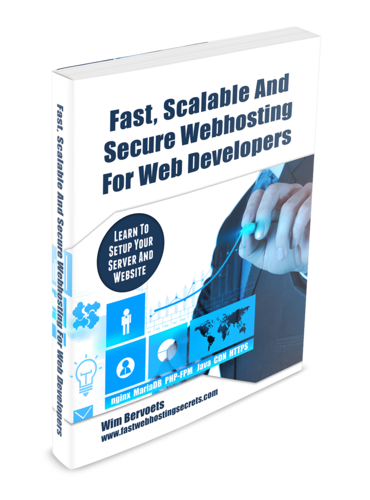 After reading Fast, Scalable And Secure Webhosting For Web Developers you'll have the knowledge to run your site on a speedy, scalable and secure server. Plus you won't panic when something goes wrong! This book is intended for web developers, internet marketers, startup companies and DIY people who have some experience in building websites and the surrounding technologies but have outgrown their current hosting. PHP a server-side scripting language which is used by more then 240 million websites. Configure the memory object caching system to speed up dynamic websites by reducing the load on the database. How to keep your PHP version up-to-date! Make your site secure by running it over HTTPS! Wordpress is one of the worlds most used blogging platforms. It allows you to easily publish a weblog on the internet. Install and configure performance related WordPress plugins to make WordPress fly! The Google Pagespeed module optimizes your site for better end-user performance! Configure it for optimal performance! More chapters for free in the future! Make your site secure with HTTPS – that’s our free gift for you! Register below and receive our free chapter instantly! Aside from that I'm a professional Java developer / architect with 15 year experience in building enterprise based systems. If Fast, Scalable And Secure Webhosting For Web Developers isn't the best book on the topic, or if you aren't satisfied, there is a hassle-free refund. If you're not happy, I don't deserve your money.